Back in the 70's miniature camera's were the bomb. Maybe you've seen a dusty mid 70's miniature camera sitting in the window of a pawn shop, or - if you watch old reruns of The Bob Newhart Show or Family Affair or the Mary Tyler Moore Show - you've maybe seen a flash of a small 70's era miniature sitting in the background. They took great photos that were fantastic contrast and sharp images. These little cameras were loaded with what was called 110 film, which were these iconic little plastic cartridges that were long and rectangular with two little film canisters on either end - you've probably seen one, and as soon as you see one you'll go oh yeah, right, that film. 110 film became really popular because of it's easy loading and unloading, and it took great photos. But, production was halted in 2009, and since then no one was making it until Lomography started making 110 with it's Orca film. And now, Lomography has released two incredibly cool miniature cameras that use the 110 format, and shoots fisheye full circle pictues! Very cool. 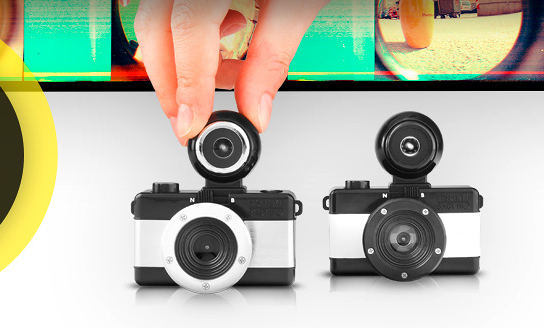 There's two models - the Fisheye Baby 110 Basic and the Fisheye Baby 110 Metal. The Fisheye Baby 110 Basic uses Orca 110 film, shoots a full cicle image on a rectangular picture, and has a fisheye lens, and the Fisheye Baby 110 Metal adds on a PC flash adaptor, and has a cool metal cover. These are seriously cool little cameras, and they are a great intro back into the future of a 110 film and miniature cameras. So cool combo of old school and future, wow That is adder to my wishlist! Thanks for sharing and enjoy the weekend! Ah, so awesome!! :) I grew up with a camera that took this film in the '90's (my first camera), so I have a soft spot for it - these are so cute! ohh i wish i had one! They are so cute! I love the image style these cameras and 110 produce. It's so funny though, how digital has made me almost afraid to use film. It's like I don't want to "waste" it on a bad shot. I need to get over it and just experiment and have fun! yeah - it's kind of fun to have to wait for your film to see what you took. My first camera, probably in '92 took 110 film! I forgot about it until now...I love it when things are rediscovered and brought back to life. I love the idea of a miniature camera - it would be such a fun way to start using film again!